A lot of things fit under the umbrella of Fitness and Recreation Programs at UWSP, but not many students know what that includes. Below you can explore all of the choices available to you here on campus to have fun, get out and be active. Who knows! Maybe you’ll even discover something that you didn’t know was available on our campus. Cardio Center: Need to get your work out on? Try out our Cardio Center located in the upper level of the Allen Center on campus. The Cardio Center is a membership-based fitness facility that provides a safe, friendly and diverse environment for students to be active—and it offers more than just cardio equipment! Click here to learn more! Group Fitness: I personally like this option. If you want to stay active, but don’t have much time in your crazy schedule, go to a group fitness class once a week that normally lasts for only an hour. The instructors provide many options such as: butts ‘n’ guts, Zumba, cycling, abs, power yoga and many more. Locations vary. Check out the Fall 2018 Block 2 schedule. Aquatics Center: Are you a fish out of water? Or perhaps someone who always wanted to learn how to swim, but never had the opportunity to do so? Our lovely Aquatics Center staff is here for you! The Aquatics Center offers swimming lessons, open swim time, and events such as canoe battleship where you can gather a group of friends together and play a real-life version of battleship in our HEC’s very own pool. Learn more here. Climbing Wall: My inner adventurer is tingling with this one! How awesome is it that our school has a rock climbing wall! The Climbing Wall offers free open climbing wall sessions for students as well as membership-based sessions for students and community members. The trained UWSP Climbing Wall staff puts safety first to make everyone’s experience is a good one. Check out the link for more. Club Sports: If you’re interested in playing your favorite sport outside of our varsity athletics, look no further than club sports! Learn more about the 31 sports you can join by checking out their website. 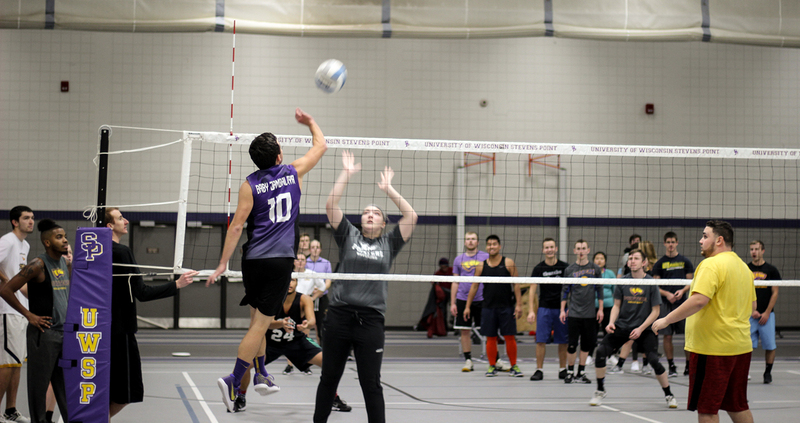 Intramurals: Intramurals offer opportunities for you to join a sports team, but the difference is this program focuses on enhancing your college experience by promoting responsibility, sportsmanship and fun with your peers here on campus. So, don’t miss this opportunity to bond with your best pals and start your very own team together! See all of intramurals options here. Open Recreation: If you want to enjoy some time to yourself in the MAC without structure or any commitment, this one is for you! Play basketball, go for a run or even check out the climbing wall during their Open Recreation hours. Their regular hours are Monday – Friday, 7 a.m. – 3 p.m. To learn more on equipment you can check out during this time, check out their website. Have fun and be active! Get plugged in right away and take a friend to experience activities together. To learn more about all of the Fitness and Recreations Programs, as well as the other awesome programs and services offered through the University Centers, go to https://www.uwsp.edu/centers/Pages/default.aspx.